G-A-M-E. Growth, Awareness, Motivation, Encouragement. 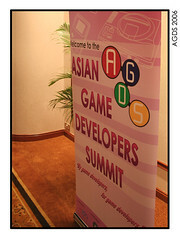 The Asian Game Developers Summit (AGDS) 2006 was held from the 9th – 10th of November at Singapore. AGDS is an industry conference aimed at promoting game development within the Asian region. AGDS provides education, networking and business opportunities and serves as a forum for programmers, artist, producers, game designers, audio professionals and others involved in the development of games to gather to exchange ideas, network and shape the future of the industry. AGDS 2006 features lectures, round-table discussions on game development topics such as design, technology, arts and animation, business, production and mobile presented by industry professionals around the region and internationally. Our regional speakers come from Singapore, Malaysia, the Philippines, and Thailand. MSC Malaysia had sponsored a group of Malaysians to the event including 5 students from MMU. Photos of the event can be found here. FREE ADMISSION ! Seats are limited. Please register early to confirm your attendance. Email to shahrizan@mdec.com.my or yuz@cmc.msc.com.my for registration. To educate those who are passionate about designing games and to provide an opportunity for communication and networking between the students and the industry who share the same interest.GDC had invited Mr. Micheal Ooi, Fung Wan Online from Phoenix game and also another special guest from the local game industry. The Flash Workshop has received a great demand in the last academic year. So this time GDC is going to make it happen for everyone who is interested in learning Flash. From this workshop, the participants will get to know how to use Flash to create simple games.